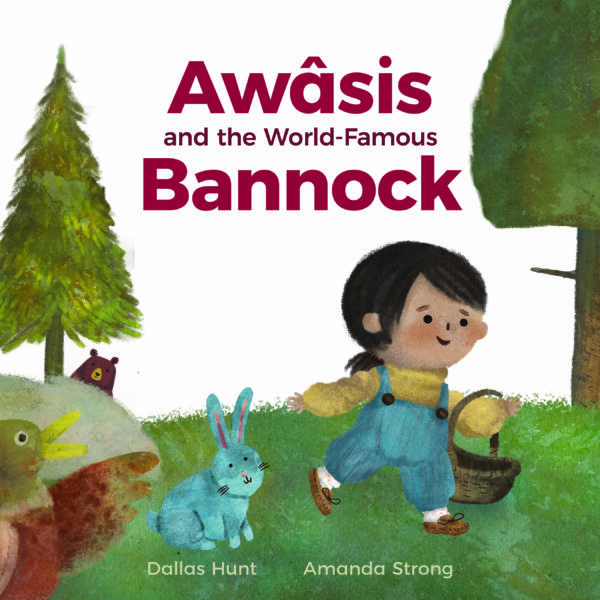 by Amanda Strong; Dallas Hunt; ill.
Awâsis and the World-Famous Bannock tells the story a little girl who accidentally lost her Kôhkum’s world-famous bannock while walking through the forest. Sîsîp hears her crying and quacks, “What’s the matter?” After learning about the lost bannock, the duck offers Awâsis some tohtosapopimehkan (margarine), one of the ingredients of Kôhkum’s world-famous bannock. As Awâsis continues on her walk through the forest she meets several other animals, and each gives her a different ingredient for bannock until Awâsis she has almost everything she needs to make the bread. This is the debut book by Dallas Hunt, a teacher, writer, proponent of Indigenous language revitalization, and member of Wapisewsipi (Swan River First Nation) in Treaty 8 territory in Northern Alberta, Canada; and it’s illustrated by Amanda Strong, who is a Michif filmmaker, media artist, and stop-motion director. In children’s storytelling, length, image, and readability matters, especially in books like this one that challenge readers to use Cree language. Hunt and Strong strike a balance in this regard. The writing and illustrations work very well together, making the book both enchanting and educational. As an Indigenous language learner, I appreciate the use of Cree words in contexts where their meaning was clear to a non-Cree speaker. Hunt doesn’t use an English translation in the text, but rather the reader knows “Sîsîp” is a duck because he quacks and through the accompanying illustration of the animal. This association without the intermediate translation is an important process when learning a new language. That said, there is a list of words, their translation and pronunciation at the back of the book. And HighWater Press has made a pronunciation guide that is available on YouTube and the publisher’s website. Awâsis and the World-Famous Bannock suits audiences who don’t know any Cree words as well as those who are learning the language. The picture book is particularly valuable because it teaches words from common everyday contexts – animals in the forest and ingredients in a kitchen. When Awâsis arrives at her Kôhkum’s house at the end of the story, they begin to make the world-famous bannock to share with Awâsis’s new friends. Kôhkum’s recipe, with ingredients in English and Cree, can be found at the end of the story. My five year-old daughter was able to follow the steps, which brought all of the ingredients into one bowl to be mixed into a lovely soft dough. She then shared it with her friends – and her Kôhkum. The United Nations has proclaimed 2019 the International Year of Indigenous Languages in an effort to raise awareness about Indigenous language endangerment and to support efforts like those of Hunt and Strong to revitalize, preserve, and maintain Indigenous languages through knowledge-sharing and integrating Indigenous languages into standard settings. The 2016 census documented 354, 665 Cree people in Canada, and 96, 575 people who speak the Cree language. While it has several dialects, taken together as one language, Cree languages constitute the most widely-spoken Indigenous languages in Canada. Even so, the language is endangered, and as University of Winnipeg Indigenous Studies professor Dr. Lorena Fontaine told the CBC in 2016, “unless we do something in this generation – the generation of my daughter – the languages will die.” In one small way, reading and learning from this book is one step that anyone in Canada can make to support this work so that Indigenous languages and concepts will continue to be a vital part of the intellectual life in Canada. Mary Jane Logan McCallum is a professor of history at the University of Winnipeg and the author of Structures of Indifference: An Indigenous Life and Death in a Canadian City. She is Lunaape heritage and a member of the Munsee Delaware Nation.